Conference icebreakers, education, museums, workplaces, art exhibitions, care homes, festivals, parties; the list of potential Origami venues is almost endless. Whatever time of year the event, Origami can be tailored to fit; Father Christmases, nativity scenes, hearts, baskets, bunnies, hats, bats, witches. Cards to thank and celebrate every season with a multitude of designs. From penguins to parrots, goats to guitars, there is something of interest for all. If there’s nothing for you – invent your own. As all that is needed is paper, supplied by me, and enthusiasm, every age group from eight upwards can participate. 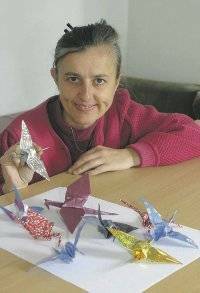 My name is Angela Loveridge and I have been folding since 2002. Since starting a monthly group at Greenhouse, I have worked in schools, summer playschemes, Women’s Institutes, Scout and Guide groups, old people’s homes and have had installations in various galleries across the North West. In a first hour a complete beginner can produce several simple models, a classic multiform or one complex item. A series of classes will help improve technique and diversity. Installations, dioramas can be created – see gallery. This will be for women only, no children. The sessions will be weekly for six weeks. Sankofa Bird folding event review and photographs of the day. Marking International Slavery Day from the Albert Dock, Liverpool. Origami can be a challenge and, as such, a great sense of achievement, joy and wonder is experienced when a model is completed. Penguins on the march at last meeting in Greenhouse. Enthusiam takes over and a colony is born! 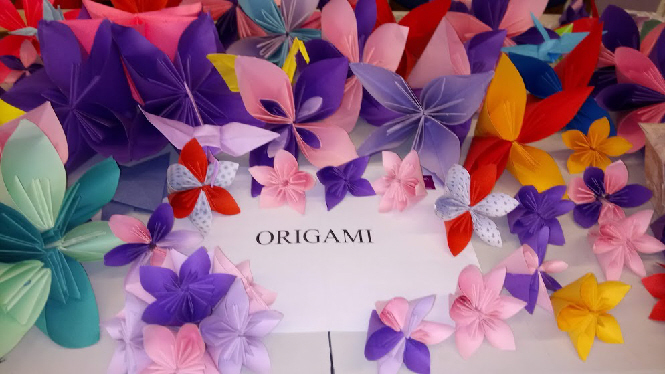 The British Origami Society is easy to join and a great place for folding, friendship, fun. Bi-annual conventions give great encouragement, access to a wealth of experience and is guaranteed to blow your mind. Thanks to Leonard Cheshire, Communities First, Glastonbury, Red Dot Exhibitions, Big Arts Week Wales, Maritime Museum Liverpool, HeadSpace and Gwynedd Council. Feel free to contact me for any Origami needs.